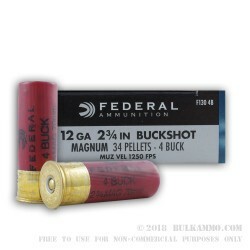 This 12 Gauge shell by Federal contains 34 pellets of #4 buckshot for a total load of 703.8 grains. That makes it a great choice for deer, coyote, and other similarly sized game. It is also a strong contender for use in home defense, as it provides a good balance of penetration and stopping power considering the distances usually involved in such scenarios. 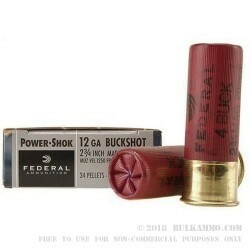 Federal’s Power-Shot line of ammunition features their proprietary Triple Wad system, which provides better shot alignment. This shell additionally offers a granulated plastic buffer to keep pellets in a uniform shape. With its muzzle velocity of 1,250 fps, this shell offers tight downrange patterns that will help you take game effectively. Based in Minnesota, Federal has spent nearly a century developing thousands of specialized types of ammunition for every conceivable need. 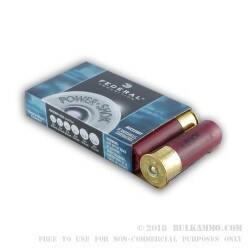 This versatile shell is one of many proofs that Federal is one of the most complete ammunition companies in the business.